August 25 - St. Louis, King - Optional Memorial - My Catholic Life! their cross and follow me” (Mt 16:24). Today’s saint fulfilled Christ’s commandment in two ways. First and most obviously, King Louis IX of France, or Saint Louis, took up his cross by practicing serious physical mortifications his entire life. He wore a hair shirt, fasted, never took God’s name in vain, and would not tell jokes or even laugh on Fridays. Secondly, he had a cloth cross woven onto his tunic and thus became a knight crusader. Louis and countless other medieval knights understood the commandment to “take up your cross and follow me” to be fulfilled not by mortification but by wading into battle with the sign of Christ on their chest. That visible cloth cross boldly proclaimed a man’s commitment to liberating the Holy Land from Muslim control through hard battle. When Louis was a child his mother told him, “I would rather see you dead at my feet than that you should ever commit a mortal sin.” He never forgot her words. After his father’s early death, Louis was crowned, or anointed, king as a teenager. He married at twenty and he and his wife had eleven children. He was totally devoted to Christ and the Church, praying the breviary every day, attending daily Mass, and constructing stunning churches, including Paris’ Saint Chapelle to house his collection of relics, particularly that of the true Cross of Christ. He was so disturbed by the sin of blasphemy that he promulgated a law that all blasphemers be branded on the lips. He waged war against the Cathars of southern France and, together with the Dominicans and the Inquisition, vanquished their heretical movement. Louis possessed an elusive charisma that made people not only want to be in his presence but also to touch his person. He was well educated, friendly, curious, and truly humble. Every man was his friend. He invited the quiet Saint Thomas Aquinas, who was studying in Paris at the time, over to dinner for theological conversation. He promulgated laws respecting the presumption of innocence and due process for everyone. He was, in short, the model Christian king who reigned over a golden century when France was the largest, most united, and wealthiest kingdom in Europe. Despite his fame and the creature comforts of home, Louis made the courageous, if reckless, decision to personally lead two crusades. The first was initially successful but ended disastrously with Louis’s army being crushed and he being captured. Only a king’s ransom secured his release. The second crusade he embarked on was even more disastrous. King Louis died of typhus, along with many men in his camp, on the shores of modern Tunisia, having just begun their journey. One of his last acts was to kneel by his bed to receive Holy Communion. He had wanted to die a martyr, or a confessor, for the faith. His desire was not technically fulfilled. But he did give his life sacrificially in the noble, centuries long, quixotic quest to reconquer, and preserve, Jerusalem and the Holy Land for Christian pilgrimage. He was canonized in 1297. 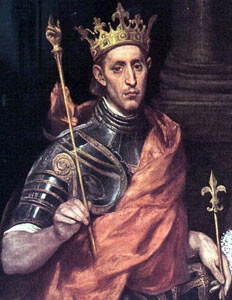 Saint Louis of France, you were intrepid in your love for Christ and the Church. Give all modern Catholics some of your same daring spirit, so that we may be courageous in living and spreading the faith, so that we too may give and not count the cost. THE mother of Louis told him she would rather see him die than commit a mortal sin, and he never forgot her words. King of France at the age of twelve, he made the defence of God’s honor the aim of his life. Before two years, he had crushed the Albigensian heretics, and forced them by stringent penalties to respect the Catholic faith. Amidst the cares of government, he daily recited the Divine Office and heard two Masses, and the most glorious churches in France are still monuments of his piety. When his courtiers remonstrated with Louis for his law that blasphemers should be branded on the lips, he replied, “I would willingly have my own lips branded to root out blasphemy from my kingdom.” The fearless protector of the weak and the oppressed, he was chosen to arbitrate in all the great feuds of his age, between the Pope and the Emperor, between Henry III. and the English barons. In 1248, to rescue the land which Christ had trod, he gathered round him the chivalry of France, and embarked for the East. There, before the infidel, in victory or defeat, on the bed of sickness or a captive in chains, Louis showed himself ever the same,—the first, the best, and the bravest of Christian knights. When a captive at Damietta, an Emir rushed into his tent brandishing a dagger red with the blood of the Sultan, and threatened to stab him also unless he would make him a knight, as the Emperor Frederick had Facardin. Louis calmly replied that no unbeliever could perform the duties of a Christian knight. In the same captivity he was offered his liberty on terms lawful in themselves, but enforced by an oath which implied a blasphemy, and though the infidels held their swords’ points at his throat, and threatened a massacre of the Christians, Louis inflexibly refused. The death of his mother recalled him to France; but when order was reestablished he again set forth on a second crusade. In August, 1270, his army landed at Tunis, and, though victorious over the enemy, succumbed to a malignant fever. Louis was one of the victims. He received the Viaticum kneeling by his camp-bed, and gave up his life with the same joy that he had given all else for the honor of God. Reflection.—If we cannot imitate St. Louis in dying for the honor of God, we can at least resemble him in resenting the blasphemies offered against God by the infidel, the heretic, and the scoffer.